Question 1. Which statement about RADIUS security is true? 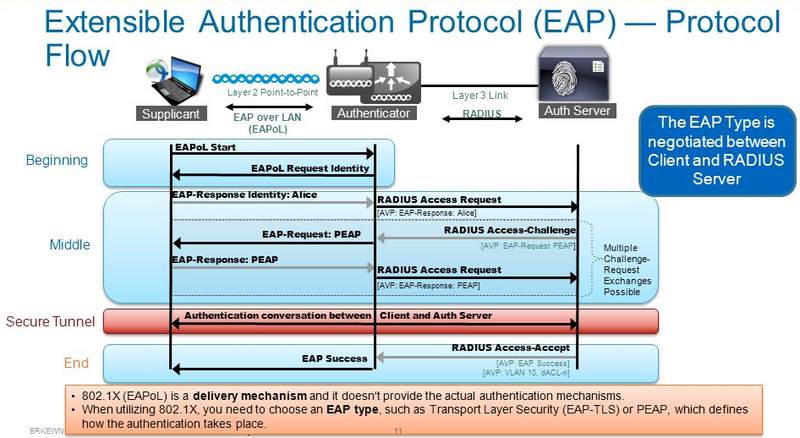 RADIUS provides authentication, authorization, and accounting (AAA) services in network environments. When users attempt to access a network device, a RADIUS server verifies that the user is legitimate (authentication). The RADIUS server can then assign certain levels of access to network resources (authorization). Finally, the RADIUS server keeps track of how long that user stayed connected and how much data the user sent or received (accounting). Question 2. Which condition indicates that service password-encryption is enabled? A. The local username password is in clear text in the configuration. B. The enable secret is in clear text in the configuration. C. The local username password is encrypted in the configuration. D. The enable secret is encrypted in the configuration. Service password-encryption affects plain text passwords such as the line passwords or the enable password. This feature uses a simple substitution method to create a “secure” non-text password displayed in the configuration. Question 3. Which command can you enter to configure a local username with an encrypted password and EXEC mode user privileges? Question 4. Which command sets and automatically encrypts the privileged enable mode password? Question 5. The enable secret command is used to secure access to which CLI mode? Question 6. Refer to the exhibit. What is the result of setting the no login command? D. no password is required for telnet access. Question 7. What is a difference between TACACS+ and RADIUS in AAA? Question 8. Which protocol authenticates connected devices before allowing them to access the LAN? A. It ensures that user activity is untraceable. B. It provides a secure accounting facility on the device. C. device-administration packets are encrypted in their entirely. D. It allows the user to remotely access devices from other vendors. E. It allows the users to be authenticated against a remote server. F. It supports access-level authorization for commands. Question 10. A security administrator wants to profile endpoints and gain visibility into attempted authentications. Which 802.1x mode allows these actions? Question 11. What should be part of a comprehensive network security plan? Question 12. Which password types are encrypted? Question 13. How do you maintain security in multiple websites? Question 14. Which of the following encrypts the traffic on a leased line? Question 15. Which command is necessary to permit SSH or Telnet access to a Cisco switch that is otherwise configured for these vty line protocols? Question 16. How to verify SSH connections were secured?